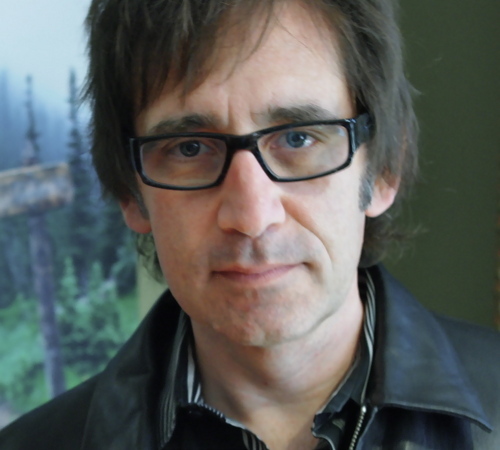 Fresh off the Camino, Brian Zahnd believes that while we are yet sinners, God loves us. In this new book, Sinners In The Hands Of A Loving God seeks to explain if God is primarily wrathful towards us or if God’s nature towards us is loving. 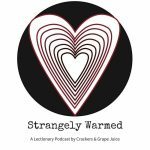 In this episode we continue our conversation with Brian Zahnd, author of Water to Wine, about the Eastertide lections. This week’s lections include: Acts 17:22-31, Psalm 66:8-20, 1 Peter 3:13-22, and John 14:15-21. In July we’re tracking our way through the lectionary epistle, Colossians. The text this Sunday was Colossians 1.15-29. It happened over a month ago, but I haven’t preached in a while and it’s stuck in my craw this whole time the way sunflower seeds leave little nagging cuts in your gums. The night after the deadliest shooting in U.S. history, a baptist preacher all the way on the other side of the country, in Sacramento, California, stood up in a pulpit just like this one, in a sanctuary just like this one, and he preached an impassioned sermon (just like this one). A sermon praising– praising- (I’ll repeat it again just so you don’t miss the tone: praising) the brutal massacre of gay nightclubbers in Florida. I’ll let you all swallow the vomit I pray is now creeping up the back of your mouths. 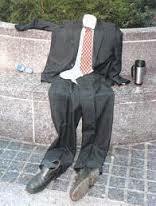 The problem is that his sermon wasn’t just impassioned. It wasn’t just red meat for a particular nasty tribe. It wasn’t just ugly and hate-filled and merciless in its stunning lack of empathy. The problem with his sermon, for you and for me, is that it was biblical. It was biblical. It was biblical. It was biblical. To name two but not the only two biblical texts. In the wake of the violence in Nice this week, when many are rushing to condemn Islam and the Quran, perhaps it’s important that we acknowledge that we’ve got texts in our own scripture that endorse, proscribe, and justify violence and terror. Plenty of such texts. While “Reverend” Jimenez made the front page of the Washington Post, we all have that family member, that coworker, that neighbor who shares a perspective that’s substantively no different than that pastor in California. And, chances are, that family member, that coworker, that neighbor believes the bible is on their side. So what do we do with them? Those texts? But, that’s the problem isn’t it? It doesn’t settle anything because the Bible says lots of things. Lots of contradictory things. And that can lead you to believe lots of things. Lots of contradictory things. So that doesn’t settle it. It doesn’t settle anything. Just take John 8 as Exhibit A. In John 8 the Pharisees haul an adulteress up the Mt of Olives and throw her at Jesus’ feet. The Pharisees remind the rabbi how the Bible clearly commands that they stone this woman to death for her sin. And certainly any rabbi, who can quote scripture chapter and verse like Jesus, knows they’re correct. Numbers 5 commands it too. Leviticus 20, Deuteronomy 22, Numbers 5- these aren’t just random, man-made laws. They’re commands, given to Moses on Mt Sinai by God. It’s easy to forget that after God gives Moses the 10 Commandments, the ones we like and want to nail on walls everywhere, God kept on talking, face-to-face, with Moses. Giving Moses 623 additional commandments. Including those ones in Leviticus 20, Deuteronomy 22 and Numbers 5. A rabbi should believe it. So they ask Jesus to settle it. Jesus chooses mercy not sacrifice. In this instance where the Bible is clear and unambiguous, in this instance where the crime and the commanded punishment are spelled out unequivocally in black-and-white- in this instance, Jesus chooses grace and mercy. And by choosing grace and mercy, in this instance Jesus chooses to violate the explicit command of God. The Bible says it. They all believe it. But in this instance belief in the Bible does not settle it for Jesus. I wonder though- is this just an instance? Would Jesus say stone her next time? Sure, he tells the woman to go and no longer sin. But what if she did? What if the Pharisees caught this woman again in adultery a few months later and again brought her to Jesus, how do you think Jesus would respond the second time? Or, say, the fifth time? Doesn’t feel like it jives with the Jesus story does it? Of course, the woman at Jesus’ feet on the Mt of Olives- she’s just one example. Again and again in the Gospels, Jesus trespasses upon the clear, black-and-white, face-to-face commandments of God. God commanded Moses to stone Sabbath-breakers. And Jesus heals so many people on the Sabbath it’s like he refuses to do anything but. God promised to Moses that he would visit the sins of the parents upon their children to the 4th generation. And Jesus says to a man born blind that God would never punish him for his parents’ sin. God commanded Moses to exact vengeance upon enemies, to take an eye for an eye taken. And Jesus refuses to take up the sword, giving up his life rather than take one. And then when you get to the end of the Jesus story, it’s those most committed to the Bible who conspire to kill Jesus. The Bible tells them to. In Leviticus 24 and Deuteronomy 13. God told Moses, face-to-face, to do that very thing to blasphemers and sabbath-breakers and false prophets. The Bible said it. They believed it. So that settled it. Saying ‘The Bible said it’ doesn’t settle anything because, let’s be frank- the Passion story makes clear- the Bible can lead you to carry a cross or to build one. Of course, that’s only a problem if you confuse the Bible for the full revelation of God. It’s only unsettling if you think the Bible is the capital -W- Word of God. Now, I know when we read scripture in worship we’ll say ‘This is the word of God for the People of God. Thanks be to God.’ And you hear all the time that the Bible is infallible or inerrant or inspired by the Spirit. The claims we so often make about the Bible, the Bible makes about Jesus. The claims we so often make of the Bible, the Bible makes of Jesus. Jesus is the image of the invisible God. Jesus is the one in whom all things hold together. Jesus is the one in whom the fullness of God dwells. With those verses, Paul and John deliberately up-end the entire way we read the Bible because, according to the Bible, lots of people have seen God. A former Pharisee like Paul would know that Adam and Eve and Enoch walked with God. A bible-believing Pharisee like Paul would know that Abraham and Sarah ate with God by the oaks of Mamre and that Jacob freaking wrestled God by the riverside. A rabbi like Paul would know that Moses saw God on top of Sinai where he received from God the 633 commandments that comprised Jesus’ Bible. And Paul would know that Moses wasn’t alone up there either. Scripture says 70 Elders of Israel ate with Moses and God on top Sinai. So they saw God too. As did the prophet Isaiah in the year King Uzziah died. So did Daniel and Ezekiel. According to the Bible lots of people, patriarchs and prophets, saw God so what could John possibly mean by asserting that no one has ever seen God? What could Paul mean when he proclaims that Jesus, only in Jesus, is God made visible, that only in Jesus does the fullness of God dwell? This couldn’t be more fundamental. They mean that Jesus, not the Bible, is the full revelation of God. Paul means that the Logos, the capital -W- Word of God became flesh; the Logos did not become a book. He means the Bible is not perfect, Jesus is. The Bible is not the redemptive mediator between God and humanity, Jesus is. The Bible is not infallible or inerrant but what it can do is reliably point us to Jesus Christ. The claims we so often make about the Bible the Bible makes about Jesus. Jesus is the Word of God, not the Bible. Jesus is what God has to say to us. Jesus is the fullness of God made visible. Compared to Jesus, you might as well say ‘No one has ever seen God.’ Because all those patriarchs and prophets who saw God, they saw God only partially. Only imperfectly. At most incompletely. Only Jesus has made the Father known. Only in Jesus does the fullness of God dwell. Only Jesus is the image of invisible God. It means that we have not always known what God is like— Moses, Abraham, the prophets…they caught only glimpses. I know that sounds like the bare minimum but, given the world we live in today and the preachers who make the front pages of the Post and the Christians who comment on CNN and social media, I’ll take it. God is at least as nice as Jesus. Because Jesus, not the Bible, is the fullness of God revealed. When it comes the character of a congregation, I think there is no more important distinction to draw than that one. Because, let’s be honest, it would be much easier and would require much less of us to be a community based on the Bible, a community devoted to the Bible, a community that believes in the Bible and believes it to be the full revelation of God. A community that makes the Bible an end in itself can find within the Bible justification for all sorts of attitudes and actions that came naturally to sinners like us. A community can be based on the Bible and be angry and judgmental and holier than thou. A community can be based on the Bible and be hateful and homophobic; a community can be based on the Bible and be sexist and self-righteous. It can be a community that condemns sinners and cast stones and convinces itself that God blesses their violence. A community that treats the Bible as the capital -W- Word of God, the fullness revelation of God, can find within the Bible justification to believe in all sorts of contradictory, callous and un-Christlike ways. But a community based on Jesus Christ, a community devoted to Jesus Christ, a community that believes Jesus Christ is the image of the invisible God, that believes Christ to be the fullness of God, the full revelation of God- that community has no choice, no excuse, no leeway. It has to be a community characterized by love. Humble, self-giving, sinner-embracing, enemy-forgiving, sacrificial, merciful, gracious love. The kind of love defined by, made flesh in, revealed through the Word of God, Jesus Christ. The Bible says that Jesus- NOT THE BIBLE- is the Word of God, the fullness of God, the image of the otherwise invisible God. And that’s our answer to fraudulent Christians like that pastor on the front page of the Washington Post. Because ultimately it doesn’t matter what the Bible says about this or that because what some claim about the Bible, the Bible claims about Jesus. Jesus Christ is the Word God speaks to us. So we cannot speak anything of God that we cannot imagine Jesus saying. The words mean the same thing: Caesar, Christ. They both mean King, Lord. You cannot affirm one with out renouncing the other. Which is why in Paul’s day and for centuries after when you submitted to baptism, you’d first be led outside. And by a pool of water, you’d be stripped naked. Every bit of you laid bare, even the naughty bits. And first you’d face West, the direction where the darkness begins, and you would renounce the powers of this world, the ways of this world, the evils and injustices of this world, the world of More and Might. Then, leaving that old world behind, you would turn and face East, the direction whence Light comes, and you would affirm your faith in Jesus and everything that new way of life would demand. In other words, baptism was your pledge of allegiance to the Caesar named Yeshua. A few hundred years after Paul wrote his letters, the Caesar of that day, Constantine, discovered that it would behoove his hold on power to become a Christian and make the Empire Christian too. Consequently, what it meant to be a Christian changed. It moved inside, to our heads and hearts. What had been an alternative way in the world became a religion that awaited the world to come. 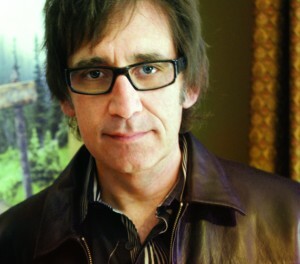 Jesus, as Brian Zahnd likes to say, was demoted from Risen Lord of the Earth to Secretary of Afterlife Affairs. And for Paul everything God had heretofore revealed to his People telegraphs the way of Christ. All those strange kosher laws in Leviticus? They anticipated the day when Christ would call his disciples to be a different and distinct People in the world. ‘Eye for an eye?’ It was meant to prepare a People who could turn the other cheek. The ‘You shall have no other gods’ command was given so that we could recognize that kind of faith when it finally took flesh and dwelled among us. When Paul writes that Christ is the telos of the Law, he simply dittos what Jesus himself says to kick off his most important sermon: “Do not think that I have come to abolish the Law; I have not come to abolish them but to fulfill them. The life of Jesus displays the grain of the universe. And that’s why being loyal to Christ can be so difficult and complicated because if the life of Jesus displays the grain of the universe then Christianity entails a hell of a lot more than believing in Jesus. It’s about following after Jesus. The grain of the universe is revealed in the pattern of life that led to the pounding of nails into wood through flesh and bone. The way to deal with offenders is to forgive them. The way to deal with violence is to suffer. The way to deal with war is to wage peace. The way to deal with money is to give it away. And the way to deal with the poor is to befriend them. The way to deal with enemies is to love them and pray for them. And the way to deal with a world that runs against the grain is to live on Earth as though you were in Heaven. Bowing to this King should make us a lot more dysfunctional in our world than we otherwise would have been. It’s no wonder our culture- Christians included- would prefer us simply to ‘believe.’ Believe in a generic god. Or just believe in the freedom to believe. The “beauty of nature may lead you to declare the glory of God,” as the Psalmist sings, but the beauty of nature won’t ever lead you to a Jew from Nazareth. And you can be safe and damn certain it won’t ever lead you to a Cross. Despite what Joel Osteen promises, we’ve no reason to suppose it’ll turn out any better for you than it did for Jesus. On the other hand, whenever you work against the grain, even when that seems the easiest, most obvious thing to do, eventually you’ll run into difficulty. And ultimately the fruit of your labor will not be beautiful. Perhaps as much as anything that’s what it means to have faith in Jesus, the telos of the universe, the King of Heaven and Earth. It’s to trust that in the End the shape of his life will have made yours beautiful. 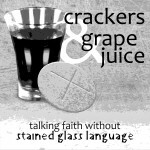 We had a great response to the first episode of the Crackers and Grape Juice Podcast. 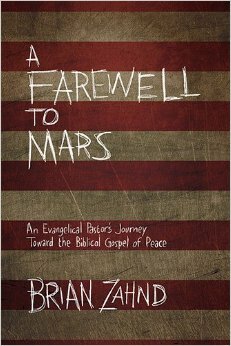 Here’s Part II of our conversation with Brian Zahnd, author of the new book, Water to Wine. You can download the episode and subscribe to future ones in the iTunes store here. We’d love for you to give us 4 Stars and a good review there in the iTunes store. It’ll make it more likely more strangers and pilgrims will happen upon our meager podcast. ‘Like’ our Facebook Page too. You can find it here. 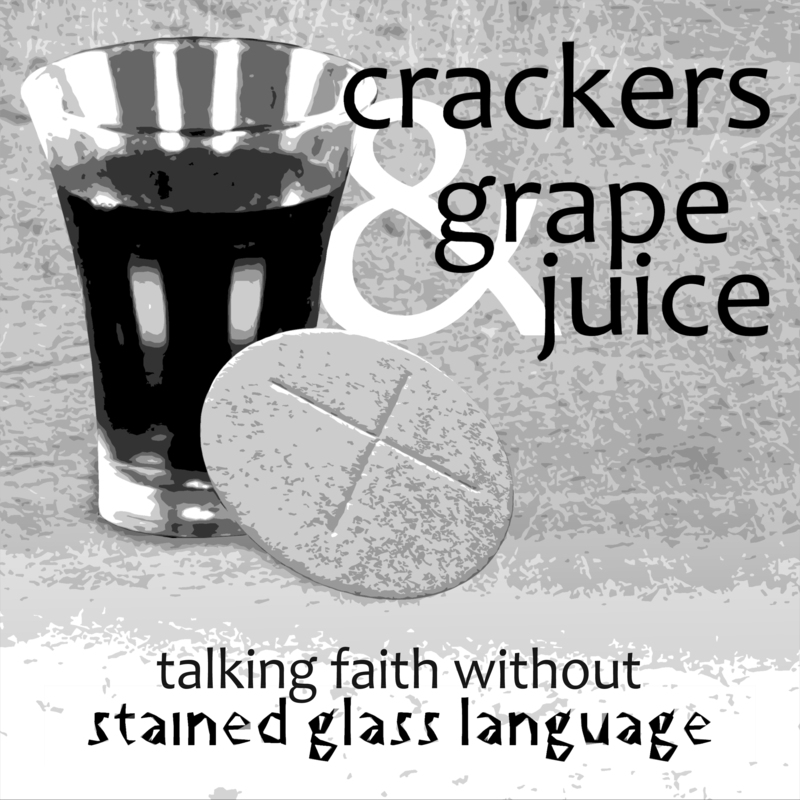 For our first ‘official’ episode in our new Crackers & Grape Juice Podcast, Teer Hardy and I enjoyed a conversation with Brian Zahnd, author of the new book Water to Wine: Some of My Story. It’s a well-written thoughtful book. You should check it out. 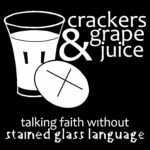 Crackers & Grape Juice already has 5x more listeners than the average UMC on Sunday morning! We talked to Brian for quite a bit so we’re spreading the love over two episodes. In this one, Brian talks about his theo-conversion from being a Word-Faith, Mega-Church pastor to rediscovering the riches of the ancient Christian faith and, in the process, risking alienating his congregation. Better yet, give us a fantastic rating in iTunes so others will happen upon it too. You can follow us at Facebook and like our page here. And you can find all the episodes at Spreaker too, here. Props to my friend Clay Mottley for letting us use his music. Check him out here. My wife complains that I have too many mistresses. At the beginning of Holy Week this year, Ali and I snuck away to Quebec City for a romantic getaway at the Frontenac, overlooking the icy St. Lawrence river. Just the two of us…and Karl Barth. …and Brian Zahnd’s new theological memoir, Water to Wine: Some of My Story. Ali says she’s tired of sharing our bed with Barth. I could be watching Tiny House Hunters instead, I tell her. She was watching Jessica Jones. In Water to Wine, full-time pastor, sometime author, and frequent voice in my earbuds, Brian Zahnd, describes three dreams God gave him during his mid-life theological crisis. Each dream, Zahnd believes, revealed a further step along his theological journey out of the shallow, ‘cotton-candy’ Christianity of his upbringing and success and into the rich, robust vintage of the ancient Church fathers and mothers. Like the patriarchs of scripture, Zahnd received a dream communique from the Almighty, not of ladders traveled angels but of shoe shopping- yes- in Zurich with the late Swiss theologian, Karl Barth. Zahnd takes the dream to mean that God encourages him to try on the different shoes available to him in the Zurich marketplace; that is, God blesses his quest to move beyond the thin choices of his American pop-evangelical tradition to taste and see (and try-on) the living tradition of the global faith. This dream of shoe-shopping with Karl Barth piqued my interest, for, as it happened, during our romantic getaway, I had returned to Karl Barth’s Dogmatics even while reading Water to Wine. Hearing of Zahnd’s dream I wondered, for the first time, how Barth, on whom I cut my theological teeth, might respond to Zahnd, the preacher most often in my head while I exercise. No doubt Barth would approve heartily of Zahnd’s emphatic insistence that ours is a God who speaks. In the present. For Barth and Zahnd, the God of Israel is not the moribund god of modernity but a Living God who reveals himself. On the loquaciousness of this God, I expect Barth would fist bump Zahnd against the settled nature of so much Christianity in the West. Indeed I suspect both share more in common than either do with my own Methodist, mainline tribe where God is most often either a character in an ancient text, from whom we can by our own light and volition derive practicable principles for daily living or is the object of our own subjective, emotional feelings. In neither case is God a living, active subject of verbs that work on, move on, and sometimes include you and me. On the talkativeness of God, I think Karl Barth would commend Brian Zahnd for retrieving wine where so many Christians are sated by the water of mission trip ‘cry nights’ and 3-point sermonic slides. God has always been like Jesus. There has never been a time when God was not like Jesus. On the one hand, I’d wager that Karl Barth would find much to affirm in this slight but bold assertion. Barth, I’m sure, would raise his pipe or brandy in approval at the conviction that God is revealed most decisively in Jesus Christ, that in Jesus we discover all of God there is find. Jesus Christ, as Barth says, is the one Word God speaks. Even on Zahnd’s suggestion that ‘God has always been like Jesus’ Barth would concur, for Barth went further than Zahnd, positing that the very ontological nature of God was/is determined by the incarnation such that Barth could speak of the ‘humanity of God’ and argue, accordingly, that Jesus Christ is the only sacrament of God, the absolutely singular visible, material sign of God. On the other hand, I suspect Barth would pushback that Zahnd’s thesis statement is not sufficiently dialectical. Barth would caution Zahnd against any easy or obvious correspondence between God the Father and Jesus, God made flesh. Perhaps, the word ‘obvious’ is most important in reflecting upon the correlation between the Father and the Son. For Barth, incarnation names not the obvious 1-1 correspondence between the Father and the Son but the mystery that God is both unveiled and veiled in Jesus Christ. Even in the act of revealing himself most decisively in Jesus Christ, Barth says, God simultaneously conceals himself. While affirming the identification of Jesus with God all the way down- the humanity of God, as Barth puts it, we cannot say that there is no God to be known behind the Jesus of the Gospels because, as Christ, God was never self-evidently God. Barth’s dialectic of veiled/unveiled secures a continuity to the Old Testament’s depiction of God that I think Zahnd’s thesis statement at best elides and at worst supersedes but also I believe it allows a place, where Zahnd doesn’t, for those moments in the Gospels when Jesus comes across more like the angry God of Hosea than we like to countenance. The very point at which I think Barth and Zahnd would agree provides their point of departure: God speaks still. For Barth, this means that revelation is always a gift. It’s always God’s act. As in the incarnation, God’s revelation remains opaque to us, unveiled but veiled still, far off from our expectations. Only by grace do we apprehend. Knowing God is like Jesus, we still don’t know who God is. It has to be that way, Barth might say to Brian. Otherwise, we no longer require God to know God. Brian Zahnd is a pastor, author and blogger who, like me, has been deeply influenced by David Bentley Hart and the work of the early Church Fathers and Mothers. 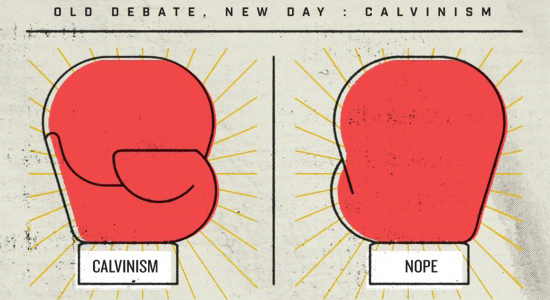 Brian recently represented what I’d call the ancient view of God and the atonement in a debate with Calvinists sponsored by Christianity Today. Don’t let the Calvinists’ propensity to machine-gun scripture citations fool you into thinking they’re making an argument, and don’t let it fool you into missing how deeply biblical Brian’s argument is itself. The videos are long and, if you’re a theology nerd, that’s wonderful. Listen while you make dinner. My secretary informed me that, as the new pastor in town, I was scheduled to preach the sermon at the annual, ecumenical Independence Day Service. 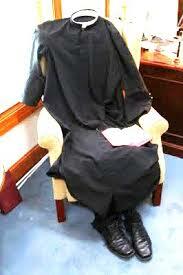 My secretary just stared at me, saying nothing, as though she were a soothsayer foreseeing my self-destruction. Independence Day Weekend is a time when a lot of churchgoers expect their pastors to preach about America or politics or patriotism. And there’s nothing wrong with those things. But, in my denomination at least, the bishop laid hands on me to proclaim not America but the Lordship of Jesus Christ. The bishop laid hands on me to preach the Gospel, and the Gospel is that Jesus Christ is Lord. The Gospel isn’t Jesus is going to be Lord one day; the Gospel isn’t Jesus will be Lord after he returns to Earth to rapture us off to the great bye and bye. The Gospel is that Jesus Christ, who sits at the right hand of the Father, is Lord. The Gospel isn’t that Jesus rules in heaven; the Gospel is that Jesus Christ rules the nations of the world from heaven. To confess that Jesus Christ is Lord is to profess that something fundamental as changed in the world, something to which we’re invited to believe and around which we’re called to reorient our lives and for which, if necessary, we’re expected to sacrifice our lives. To confess that Jesus Christ is Lord is to profess that at Easter God permanently replaced the way of Caesar, the way of the world with the way of Jesus, a way that blesses the poor, that comforts those who mourn, a way where righteousness is to hunger and thirst after justice and where the Kingdom belongs to those who wage…peace. I was commissioned to preach the Gospel. And the Gospel- the Gospel of Paul and Peter and James and John and Luke and Mark and Matthew- is that Jesus Christ is Lord. And in their day the Gospel announcement had a counter-cultural correlative: Jesus is Lord, and Caesar is not. And in our day, the Gospel has a counter-cultural correlative too. Jesus is Lord, and ‘We the people’ are not. Jesus is Lord, and the Democratic Party is not. Jesus is Lord, and the Republican Party is not. Jesus is Lord, and America- though it’s deserving of our pride and our commitment and our gratitude- is not Lord. As wonderful as this nation is, we are not God’s Beloved because Jesus Christ is God’s Beloved and his Body is spread through the world. Independence Day is as good a time as any for Christians to remember that as baptized Christians we carry 2 passports. We have dual citizenship: 2nd to the US of A and 1st to the Kingdom of God. 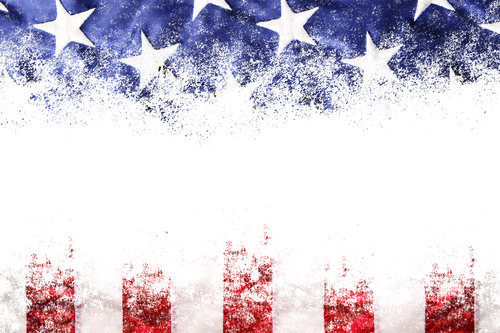 Independence Day is as good a time as any to remember that as baptized Christians, our politics are not determined by Caesar or Rome or Washington. As baptized Christians, our politics- our way being in the world- are conformed to the one whom God raised from the dead. Independence Day is as good a time as any to remember that you can be a proud American. You can be thankful for your country. You can serve your country. But if you’re baptized, then you’ve pledged your allegiance to Jesus Christ, and your ultimate citizenship is to his Kingdom. And even as we celebrate the 13 Colonies’ independence we shouldn’t forget that our primary calling as baptized Christians is to colonize the Earth with the way of Jesus Christ. Through our baptism we leave the old world and we are liberated into God’s new creation; so that, as baptized Christians, we live eternity in the here and now. That’s what Paul means when he says elsewhere that all the old national and political and ethnic distinctions do not matter because the baptized are now united in Christ. For Paul, baptism is our naturalization ceremony in which allegiance and loyalty is transferred from the kingdoms and nations of this world to the Kingdom of God. As baptized Christians, we are a People who carry 2 passports, who have dual citizenship but only 1 allegiance. I’m not saying that we shouldn’t take pride in our American identity; I am saying that our primary identity should come from the Lordship of Christ. I’m not saying our independence isn’t something to celebrate; I am saying that our dependence on God, which we’ve been liberated into by the resurrection of Christ, should be a greater cause for celebration. I’m not saying that the flag shouldn’t be a powerful symbol for us; I am saying that the Cross and the Bread and the Cup and the Water should be more powerful symbols. Because as baptized Christians, we belong to a different Kingdom, a Kingdom that can’t be advanced by force or political parties or legislation or constitutional amendments- we belong to a Kingdom that can only be advanced the way it was advanced by Jesus Christ. Should Christians Say the Pledge etc. Now, many Christians may read this and say “I don’t have a problem saying the Pledge of Allegiance, but I agree– if I have to choose to be loyal to God or country, I’ll always choose God”. If this is the case, the third problem that arises is that such an individual, when making the Pledge of Allegiance, is actually being dishonest. You can read the rest here. 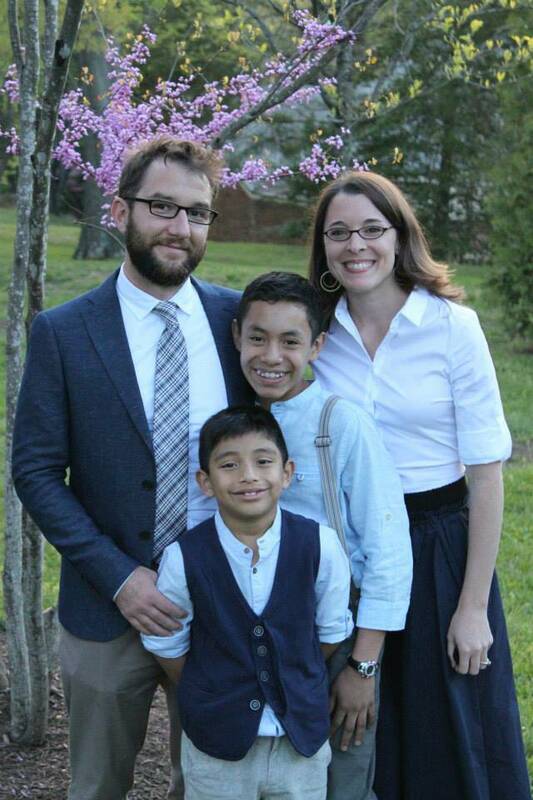 My friend and now colleague, Taylor Mertins, included a reflection about my two sons in his recent blog post. Made me cry. You can read it here. This essay from First Things, a conservative Catholic journal, nails it on Barth, I think, and articulates better than me my current feeling that our secular age requires a retrieval of Christian metaphysics. Perhaps the best way to understand the spirit of modern philosophy is to see it as a dismantling of the classical understanding of God and the ordered cosmos it sustained. Classical theism names not only a way of thinking about God but a way of understanding the nature of the world and our place in it. Developed through common effort over centuries, it came to endorse a number of interlocking theses: that God’s essence is identical with his existence, that nature is governed by an act of divine intelligence and love, that rational beings find fulfillment in learning the truth about God, and that all knowledge is grounded in God’s self-understanding. You can read the rest here. Like Bilbo Baggins I felt “thin, sort of stretched, like butter scraped over too much bread.” I’d reached the point where something had to be done. I was no longer satisfied with the “cutting edge” and “successful.” I had lost my appetite for the mass-produced soda-like Christianity of pop-culture America. I wanted vintage wine from old vines. I don’t know exactly how I knew this, but I knew it. Guided by little more than instinct I began reading the Early Church Fathers. You can read the rest here. We’re continuing our Leaving Left Behind Behind series this Sunday by talking about the rapture. One of the dangerous delusions suffered by biblical literalists is the fantasy that their reading of scripture is one shared by the historic Church. In case you’ve been spared the straight-to-video, Kirk Cameron Left Behind films, the rapture is the belief that prior to the last judgment the saved will be taken up in to heaven by Christ, leaving all the other unlucky bastards behind to deal with the mess that the PO’d returning Messiah will dole out. 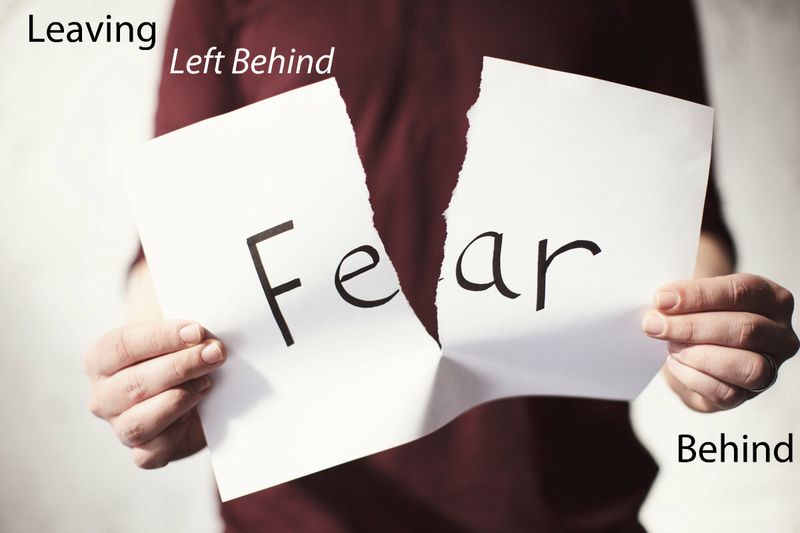 Kirk Cameron’s not the only reason the Left Behind movies are terrible. As far biblical doctrines go, the rapture is thin, ridiculous and contrary to the larger biblical narrative. The rapture might make for good pulp fiction but it’s antithetical to the greatest story ever told. After all, scripture begins with God declaring his creation ‘very good.’ It continues with God promising to Abraham to make it so again. Israel, Christ and Church are all links in the scriptural chain the ends, in Revelation, where it all began: in a Garden. New Creation. Escape from creation doesn’t fit the story. The allusion St Paul makes here is to the arrival of a victorious, conquering military leader. Those who wished to celebrate the victory would rush out beyond the city to greet the coming hero. 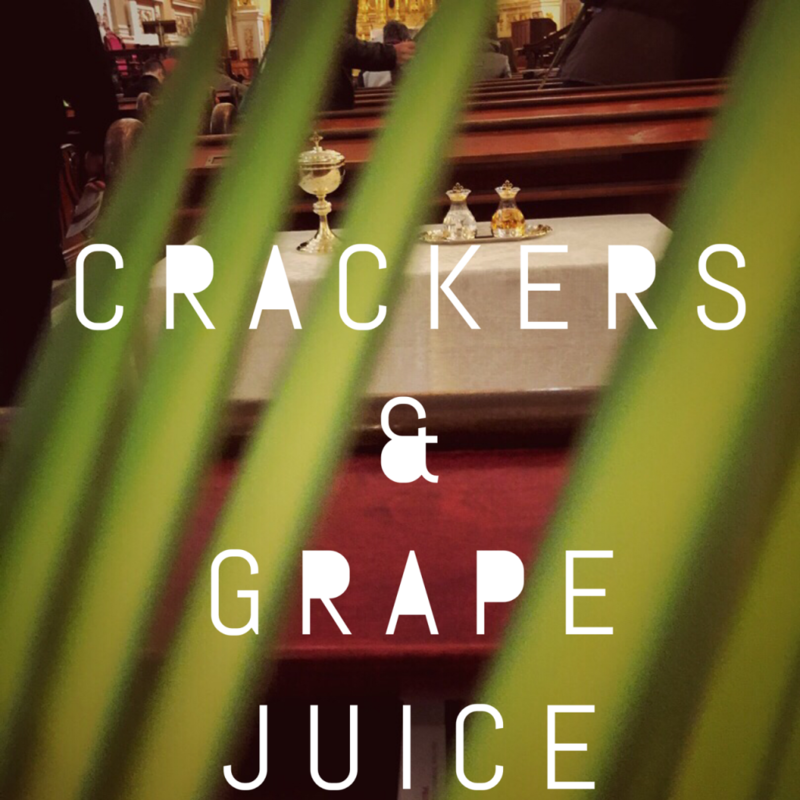 Think: Palm Sunday. This would not have been unsubtle allusion to the Thessalonians who in Paul’s lifetime had experienced such entrances (invasions) by Pompey and Augustus. The rapture mistakenly supposes that the coming Jesus has some other destination in mind. Another leg of the journey. A connecting flight. 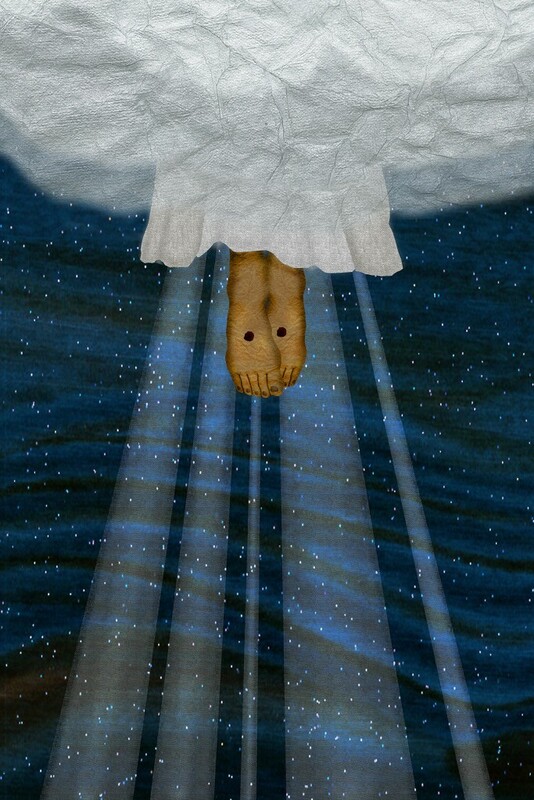 But the ‘cloud’ imagery is a clear echo of Daniel’s vision in which the Son of Man comes on the clouds when God has given him dominion- not of heaven- but the Earth. Christ returns not to whisk souls away to heaven but to rule the New Creation. As Brian Zahnd points out to read this text as a rapture of believers to heaven is like waiting at the airport terminal for a returning soldier- waiting with your own bags packed as though as soon the solider arrives home you will all be hopping on another plane for another destination. Not only is the rapture of biblical literalists a willful misreading of the text, it’s an unhistoric reading of the text. Credited to John Nelson Darby, the rapture dates only to the mid-19th century. Guess what else dates to the same approximate time period? Charles Darwin’s Origin of Species. Contrary to popular belief, Christians did not initially have a problem with evolution. Few Christians in the historic tradition ever held to a literal reading of the creation story. That God would use evolutionary means for the process to which Genesis gives poetic expression wasn’t a hard pill to swallow. Natural selection was a different animal. The notion that violence and suffering was woven into the very fabric of existence seemed to contradict the most basic conception of God as Love. No longer was it axiomatic for believers to see the world as a sacrament to God’s loving glory. Nature that was, Darwin had pointed out, red in claw and tooth. No longer charged with God’s grace, the world came to be seen in the 19th century as a closed-system of purely mechanical, material processes. So not only is the rapture unbiblical and unhistoric, it turns out that the rapture is also a ‘liberal’ belief. God is fundamentally absent from the present world. Of course, by ‘creation’ the ancient Christians never meant the processes behind the world’s beginnings. Rather Creator is our answer to the question ‘Why is there something instead of nothing?’ A question no species’ origin can ever answer. The rapture may be bulls$% as theology, but it does point out one needful lesson: the bible’s primary plot of creation-redemption-new creation falls apart once you stop seeing the world around you- even the reddened claws and teeth- as charged with the glory of God. 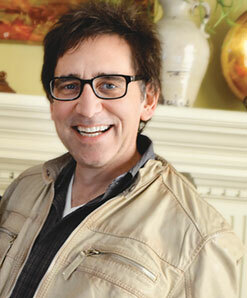 This week on the podcast we’ve got Brian Zahnd, author and the founding pastor of Word of Life Church in Missouri. About a decade ago, Brian had an epiphany/spiritual crisis that eventually led him away from his previously held evangelical, word-faith Christianity and into a rediscovery of the sacramental faith of the ancient Church. The result, in my opinion, is that Brian preaches the most theologically robust sermons of any preacher in America, rooted in the faith and understanding of the ancient Church Fathers and Mothers. Because his is a pre-Western vision of Christianity, I think it’s one perfectly-suited for the post-Christian West. Like me, Brian is a huge fan of David Bentley Hart, Bob Dylan, the National. Like me, he’s a literature and art snob and I even get him to confess it. 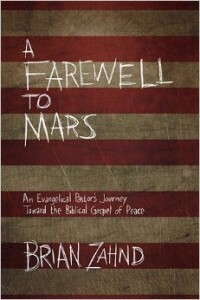 The author of Beauty Will Save the World and Unconditional– both of which I highly recommend- Brian’s upcoming book is A Farewell to Mars: An Evangelical Pastor’s Toward the Biblical Gospel of Peace. My underling left God’s work to go work for THE MAN so until I learn how to splice and dice you’ll have to listen sans the cute cue music. You can also download it in iTunes or, better yet, download the free mobile app, which you can use to listen to old installments of the podcast and look for future ones. Pope Francis has called for today to be a day of prayer and fasting for peace in Syria. Catholic or not, at a time when Christians are diffused over so many different communions and traditions, Pope Francis offers a helpful singular voice of faith, a Christ-like perspective that transcends national and cultural distinctions. There’s absolutely no defensible Christian reason not to do exactly what Francis calls Christians to do. I’ve now been at my present congregation long enough that youth I once saw dressed awkwardly for their confirmation are now wearing uniforms. I don’t want to see them wearing flags, as palls. As for their parents, this is more than an academic, theological question for me. Francis’ is the loudest Christian voice reflecting on the Church’s vocation in times of war. Popular author, Rachel Held Evans, has this piece in which she also counsels prayer and fasting. Mark Tooley, at the Institute on Religion and Democracy, has this one, in which he concedes more than counsels that Christians can pray for peace. Meanwhile, Brian Zahnd, a pastor and author in Missouri, has this post, essentially urging Christians to be a prayer for the world. While I can’t say I’m a fan of Rachel Held Evans, I do admire the openness with which she wrestles the Christianity of her upbringing. My lack of fandom probably owes only to the fact that, unlike her, I grew up neither Southern nor Evangelical. I’m also aware that minus Fleming Rutledge there’s a paucity of female theologians referenced on this blog so I feel badly that I’m being critical now. Nonetheless…in her post, ‘When It’s Too Big,’ RHE commends prayer because the Syrian issue is too complex and the right ‘solution’ too elusive. Because it’s ambiguous what Christians should do, the least they can do is pray. I’m likewise reticent to critique Tooley’s post because I don’t want to be excoriated on the IRD blog the same way Rachel herself was a time ago. Still, reading ‘Syrian War and Churches’ you’d conclude Tooley thought Christians were just foolish people except that he’s one himself. ‘Syrian War and Churches’ lauds the Archbishop of Cantebury’s support of Syrian intervention because it meets Just War criteria, which, in its lack of any defined, measurable goal, it most definitely does not. Let’s never mind the inconvenient truth that Just War Theory has NEVER prevented Christians from engaging in war. That it hasn’t suggests Just War Theory is less about discerning how Christians should navigate their dual commitments to State and Church and is more about providing a logical pretense for doing what you were going to do anyway- whatever the State wants you. The sweeping way Tooley dismisses non-violence as a legitimate form of Christian witness is a post for another day, as is the way in which his defense of Just War Theory is replete with the fingerprints of Consequentialism. Like in RHE’s post, Tooley allows for the role of prayer but scolds that Christians should not keep their faith from being serious about the solutions that may or may not be necessary when it comes to war. Though they’d never want to share the company, Tooley and RHE both share the assumption that its the calling of Christians to find the right solution and contribute towards it. Clearer put, they assume its the job of Christians to make the world come out right. 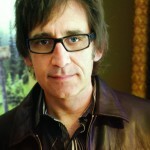 Brian Zahnd, on the other hand, gets right what I think both Tooley and RHE get wrong. Being “realistic” does not exempt us from faithfulness to Christ. If we tell ourselves that Jesus has called us to “change the world” then we quickly find ways to justify our violent means. But Jesus doesn’t call us to change the world — he calls us to be faithful to his ways of peace. If in our faithfulness to Jesus we happen to change the world, fine, but our first call is to remain faithful. Jesus calls us to love our enemies, not because this is an “effective tactic,” but because this is what God is like. If we think violence is a viable option you can be sure we will resort to it. If violence is on the table, imagination is out the window. First century Jerusalem could not imagine any other way than violent revolution against the Romans. Jesus could. Jesus not only imagined the alternative, he embodied it. On the cross. And he calls us to follow him. If we don’t know (or refuse to know) the things that make for peace, we march blindly toward another fiery Gehenna. It depends on whose lens you’re looking through. I grant that there are ways of looking at what I’m saying as foolishness. But I also insist that to live Christlike in a Caesar-like world is to risk being called a fool or worse. What Zahnd gets right that others miss is that Christians are not called to solve the world’s problems, to offer solutions as though with our worldly wisdom and worldly ways we can bring the Kingdom of God ourselves. Rather, as Jesus said right before he ascended to the Father, we’re called to witness to the Kingdom. That’s a very different proposition. When Jesus leads his disciples up to the Mt of Olives in Matthew 25, they ask Jesus: When will temple be destroyed and what will be the sign of the coming age? Rather then answer them directly, Jesus responds with a series of parables about what kind of people his People should be in order to anticipate the coming age. And the setting for all of this is the Mt of Olives, the place where Jews believed God would begin to usher in the new age (Zechariah 14.1-5). Because the setting is the place where Jews believed God would end this age, to read the parable that follows rightly you have to go all the way back to the very beginning of scripture, to God’s original design, and God’s promise for a New Creation. The Hebrew word for that harmony is ‘shalom,’ a word the New Testament translates as ‘peace.’ But it’s not just a sentiment or a feeling of tranquility. It’s restoration. Throughout scripture God’s judgment is against those who work against shalom. Shalom is not just an abstract theme of scripture; it takes tangible form in the Torah where God lays out Israel’s special charge to care for the stranger, the orphan, the widow, the sick, the poor- whether they’re on the inside of community or the outside of the community because, as Leviticus says, ‘they’re just like you’ (19). Implied in the Jewish Law is the reality that the stranger and the widow and the orphan and the poor lack an advocate in this world. They are a sign of what’s broken in creation; therefore, God intervenes for them by calling Israel to labor with him in establishing God’s shalom. This partnership between God and God’s People- this is how God puts creation back together again. This is what the Old Testament is about. Then, in the New, God becomes incarnate in Jesus Christ to model shalom for us. Until God brings forth the New Heaven and the New Earth he calls the believing community to embody in every aspect of their lives the shalom that is made flesh in Jesus Christ. The works of mercy listed in Jesus’ parable- they’re not just a simple list of good deeds. It’s a summary of what God’s shalom looks like. This parable isn’t a superficial reminder to do good to others. It’s a description of Israel’s vocation, a vocation taken on by and made flesh in Jesus Christ. The point is not that we will be judged according to our good deeds per se. The point is that we will be judged by the extent to which we embody Christ’s life. The point is not that our faith or beliefs in Jesus have nothing to do with how we will be judged. The point is we will be judged by the extent to which our faith in Christ has allowed us to conform our lives to witness to his way of life- which is the life God desired for all of us before Sin entered the world. Ask yourself: who is it that welcomes the stranger, loves their enemy, feeds the hungry, heals the sick, brings good news to the prisoner? This is a description of Jesus’ life. The sheep in Matthew 25 are saved not because of their good deeds. The sheep are saved because they’ve dared to witness to the life that redeems the world. The sign of the new age that the disciples were asking about? The sign of that new age are a people bold enough to embody the life of Christ. That’s why Jesus tells this story. When we say that Jesus is the only way to the Father, we don’t just mean our belief in Jesus is the only way to the Father. We also mean Jesus’ way of life is the only way we get to the Father’s love. Scripture doesn’t teach that after we welcome them the stranger will cease being strange to us or that our differences are insignificant. Scripture doesn’t teach that by loving our enemies our enemies will cease to be our enemies. Scripture doesn’t teach that by visiting the prisoner we’ll convince the prisoner to swear off crime. Scripture doesn’t teach that in feeding the hungry the hungry will show appreciation to us or that in caring for the needy we won’t find the needy a burden to us. The Christian life isn’t being ‘realistic’ as the world defines it, and it’s not about solutions to creation’s problems. It’s about witness to a different reality; it’s about a witness that anticipates and ever so slightly contributes towards the New Creation. In a world of violence and injustice and poverty and loneliness Jesus has called us to be a people who welcome strangers and love enemies and refuse the sword and bring good news to prisoners, feed and cloth the poor and care for those who have no one. And so Zahnd and Francis are absolutely, urgently right. Prayer isn’t what you do when the realistic solutions are elusive and its not what you do after you’ve gone about realistically solving the world’s problems. If God raised Jesus from the dead, the prayer of an alternative community is the most realistic thing there can be. I’ve had a few posts in the past in which I’ve tried to think theologically about guns. Those posts stirred up some conversation to say the least. 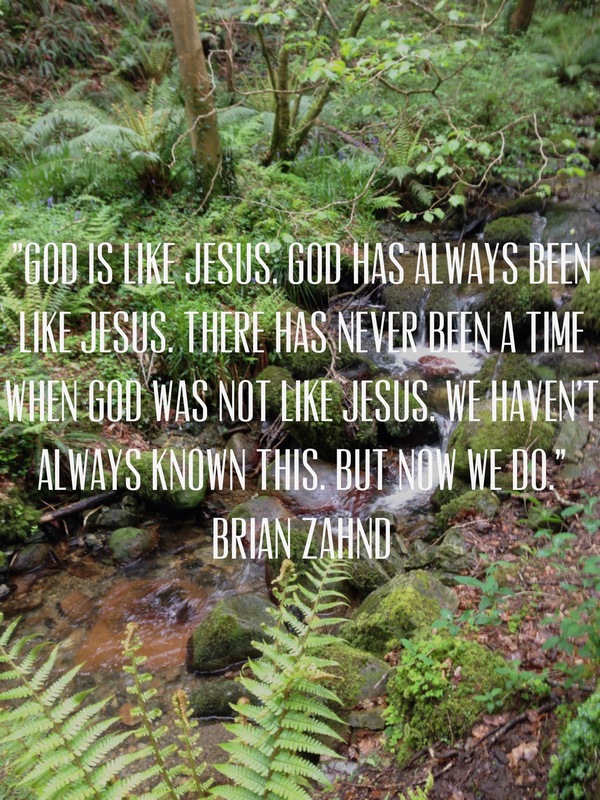 Here’s a well-spoken reflection from Brian Zahnd, a pastor and author at Word of Life Church in Missouri. I don’t own a gun. I never have. Why? First of all I don’t hunt. I have nothing against hunting. (After all, I’m not a vegetarian.) I don’t hunt like I don’t golf—it’s just something I never took up. So I don’t own a shotgun or a hunting rifle for the same reason I don’t own golf clubs. And for the same reason you probably don’t own crampons and an ice axe. Since I don’t hunt, I don’t need the equipment. Secondly, I don’t own a gun because I don’t want to shoot anyone. Shotguns and hunting rifles are designed for the purpose of shooting game. Handguns and assault rifles are designed for the purpose of shooting people. But I don’t want to shoot anyone. So, once again, I don’t need the equipment. I’m perfectly content to allow a trained and authorized police force to handle this equipment on behalf of society. I think that’s a good idea. (If you don’t think that’s a good idea, well, then we just disagree. Don’t shoot me.) I’m not a police officer, so I don’t need police equipment. I don’t own surgical equipment either, because…well, you get my point. So I don’t own a gun. What about protecting my family? Well, I’ve been married for 32 years and a parent for 31 years, and my family has remained safe. To be honest with you, home invasion is something I never think about or worry about. Am I “prepared” for it? I don’t know. I trust God and pray for protection everyday. Does that count? I don’t even have a baseball bat. (I quit playing baseball years ago.) I suppose my ice axe could be used as a weapon, but it’s in the basement with the rest of my mountain gear…because that’s it’s purpose, to climb mountains, not to be (mis)used as a weapon. So it turns out I have no weapons. I’m unprepared for a home invasion. Of course there are endless possibilities of things for which I am unprepared. I was unprepared for my grandson to get cancer, but he did…and we made it through that. If my home gets invaded tonight, I’ll just have to trust God. Am I a fool? I don’t think so. But if so, I’m a fool for Christ. 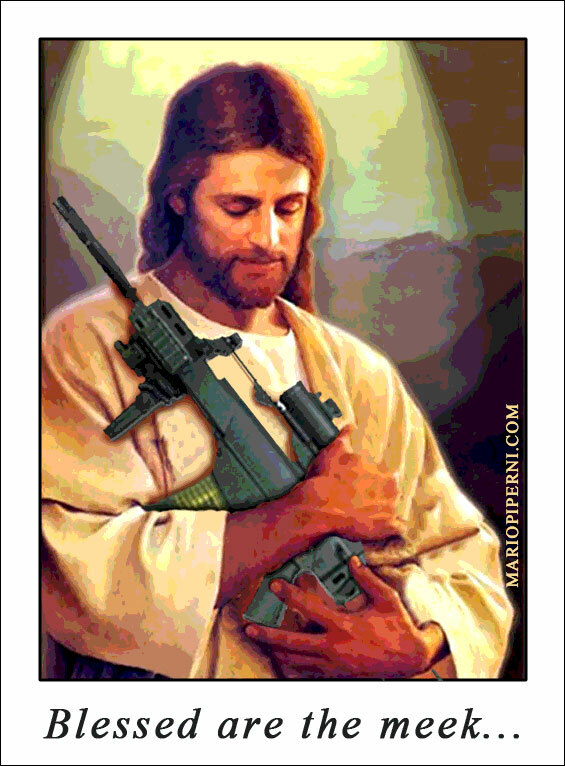 Because, though I haven’t mentioned it yet, my commitment to following Jesus is part of my decision to live without owning lethal weapons. Do you have to agree with my convictions? No. But you should respect them. Of course, someone will remind me of Peter carrying a sword (at least on one occasion). Well…I have a sword. I keep it in what I call my “closet of weird things.” I’ve used it as a sermon prop on a few occasions. Oh, and I just remembered, I also have the jawbone of a donkey. (Kept alongside the sword in the aforementioned closet.) So perhaps I’m armed after all, but only archaically so. Ultimately I choose to live without guns because, a) I don’t hunt, b) I’m not a police officer, c) I choose to live gently in a violent world. I choose not to help swell the ranks of the armed in our society. I want to contribute to a more peaceable and gentle society. Does that mean I’m unsafe? No, I don’t think so. But if I am unsafe, well, then I choose to be unsafe. Nevertheless, I’m not afraid. And I’m not ashamed to live unarmed. Does that make me less of a man? Oh, please. That argument makes me think someone is compensating for some insecurity. My father, Judge Zahnd, never owned a gun and he’s among the men I admire most. I’m sure that has influenced me. A good influence, I think. I’ve had guns pointed at me on two occasions. Once in Haiti and once in Nigeria. I didn’t like having a gun pointed at me. It’s an uncomfortable feeling. But that doesn’t mean I want to be prepared to point a gun at someone else. I am intentionally, deliberately, thoughtfully unprepared to do that. My defense will have to come from elsewhere. Or not at all. Life is risky. I accept that. Following Jesus is riskier still. I accept that as well. I’m not writing this to change the mind of Christian gun advocates. (I have a realistic assessment of my persuasive abilities.) I’m writing this in the moderate hope that Christians gun enthusiasts will at the very least respect their brothers and sisters who don’t share their enthusiasm. Neither is this a piece on gun control. I have some strongly held opinions on gun control—opinions that I formed 35 years ago while debating this topic in college—but this isn’t about that. This is simply a little blog on why I don’t own a gun. I don’t own a gun because I don’t need one and I don’t want one. And that is perfectly acceptable. Please try to be at peace with this. As I said, I don’t own golf clubs either, and that’s bound to upset some people too.